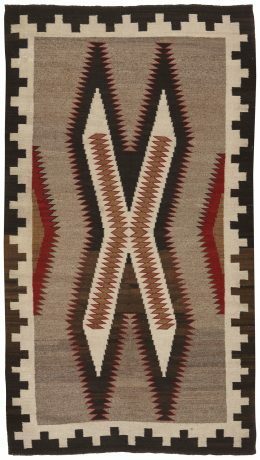 As perpetually fashionable as they are collectible, traditional Navajo rugs, skillfully woven by members of the Native American Navajo tribe, are similar to Kilims and constructed using similar time-honored techniques. 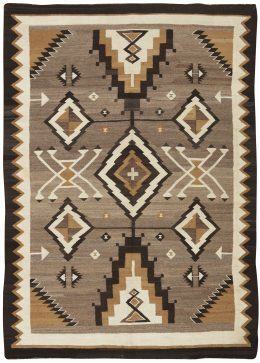 The native American Navajo tribe of New Mexico and Arizona was originally weaving wearing blankets in the early 19th century, but when they became settled on the reservation they switched to rugs inspired by Caucasian pieces made available by the local traders. The strong and direct patterns are abstract and geometric, the rigourous color palette usually includes one or more natural sheep tones, and the technique is always a flat tapestry weave. The wool has a nice tactile quality in the better examples. Vintage Navajos give a properly informal touch to any room. Nothing is better with American Western décor. 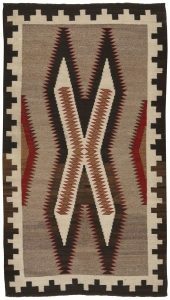 Antique Navajos are usually in scatter sizes and larger, room size pieces are both extremely rare and highly desirable.